Let’s take a look at the specs: The 600 MCM cable cutter has a 1-7/16″ jaw capacity, which means it can handle up to 600 MCM copper cables, 750 MCM aluminum cables, or up to 1-3/16″ communication cables. It’s about 10-1/2″ long, and the jaw is 4″ tall, which gives you a little bit of an idea of how well it might fit into various cutting applications. 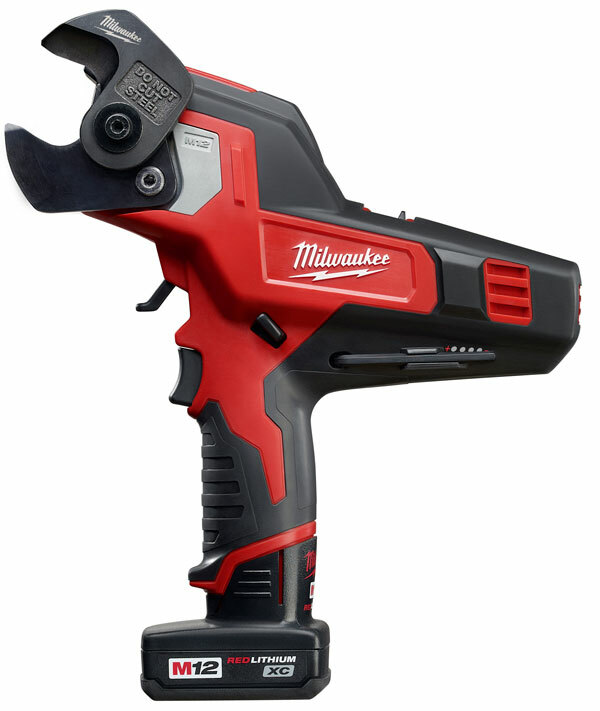 It weighs just under seven pounds complete with battery (the M12 XC RedLithium), which Milwaukee claims will give you about 150 cuts of 500 MCM copper on a charge. You also get a small LED work light, and two speed settings, one for the big copper and aluminum stuff, and the other for large (but less dense) comm cable. The blade is separately user replaceable. We don’t have pricing yet, but we’ll update you when we find out what it’ll sell for on the street — we do know that it will sell in both tool-only and a kit form, the latter of which will include the tool, a battery, and the M12/M18 multi-voltage charger. Regardless, it sounds interesting, and you’ve gotta love Milwaukee’s dedication to trying just about any damn idea they think will work for trades. Some work, and some don’t, but hell — if they hit one every few years, it’s a win-win for Milwaukee and users. Metal thieves should love these! I seriously doubt that “metal thieves” would be either willing to make the investment of either money, or time researching this kind of tool. Having seen several instances of them being arrested on the news, I have reason to doubt both their wealth, and intellect. I do have close friends however, who do scrap metal as a source of income, and they might be interested in such a tool, on condition that they found it improved their productivity. Those dirtbags steal the metal, so don’t think they won’t do their best to grab one of these out of a work truck or off a site! Your doubt of wealth and intellect will make you a target someday my friend. Some places have said list for these is around $425, which is much more than most ratcheting hand cutters. When I replaced the main panel at my mother’s house I had the electrical company come out and cut the line. The electrician had something like this, but the claw was at the very end of the device (think power screwdriver instead of electric drill). It looked incredibly handy. While I’m glad to see this tool, whhat I wouldn’t give for those cutting jaws to be replaced with 1/16 – 1/8 – 1/4 cable crimping jaws. I’d pay $200-300 for a tool that did that. Do you know how awkward trying to use the manual tool is when you’re 35′ in the air in a genie basket? Great, now let’s see an 18V version without the “DO NOT CUT STEEL” on the cutters, that can cut up to 1/2″ steel cable. THAT would be worth the $300-400. I can’t wait to see this in use during the next (non-historic) mafia move.